This year’s Black Literary Suite (BLS) brings together the work of group of black women writers in a themed exhibit “Women Writing Women: Reclaiming the Body.” Sponsored annually by The Project on the History of Black Writing, the exhibit is both a physical and digital interface that highlights known and little known writers who narrate culture and explore its contradictions. 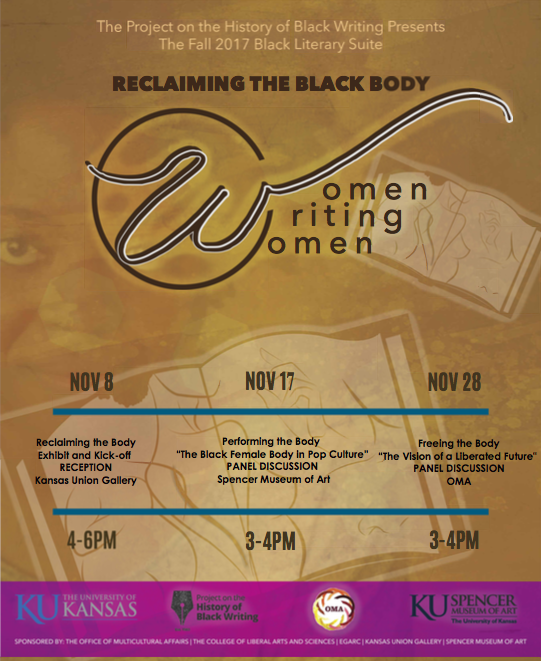 Acknowledging the primacy of physical violence against the female black body, “Reclaiming the Black Body” seeks to open up a new conversation through works that tells us a different story about agency and self-ownership, of making and remaking themselves, actively reclaiming their own bodies. “Reclamation” is defined as the process of claiming something back or reasserting a right. We use reclaiming here to refer to both the physical and ideological space that allows for innovative and powerful expressions of female sexuality and power. Our goal in this year’s Black Literary Suite is to engage in a conversation about the power that this legacy of black women’s writing has had. On display at the Kansas Union Gallery through the end of November, we are featuring 10 foundational writer and activists of the period. Join us for our Kickoff Reception at the Kansas Union Gallery on Wednesday, November. 8th starting at 4pm. To compliment our panel discussions, we are hosting four Twitterchats starting at 8PM(est) / 7PM(cst) on the following dates. You can follow us @ProjectHBW and follow our hashtags #BlackLitSuite and #HBW. Co-sponsors: Kansas Union Gallery, Office of Multicultural Affairs, Spencer Museum of Art, EGARC, and the College of Liberal Arts and Sciences. 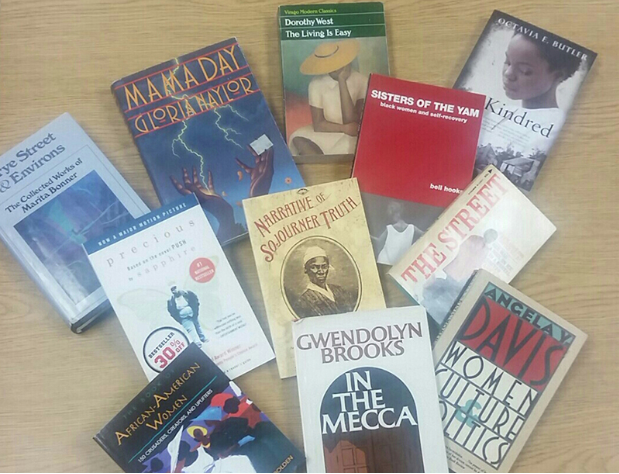 Support the work of The KU Project on the History of Black Writing! Make your charitable donation today.